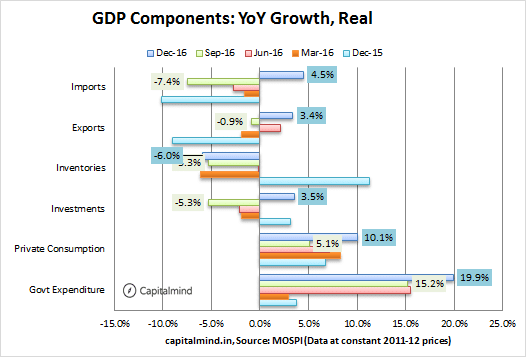 GDP Growth at a Surprising 7%, Government Spends Up 20% in Q3 – What Demonetization? 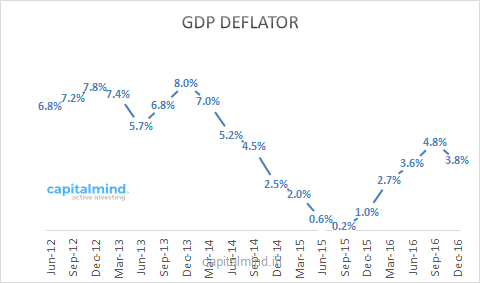 India’s GDP data is here. You might not believe it, but it’s here. The numbers are interesting. Nominal growth was up about 10%. 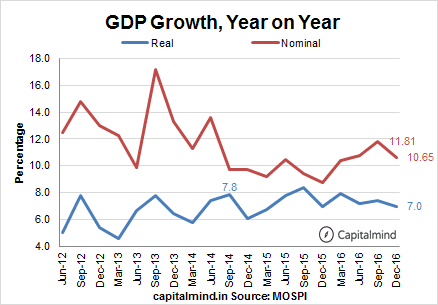 Real growth (Nominal minus inflation) was up about 7%, over the December quarter in the previous year. There was a “dip” in the December quarter in 2015, when nominal growth was about 8.74% and inflation was deemed be just 1%. This dip is what we have to compare with, so there will be a little bit of a base effect here. Private consumption went up 10% in the demonetization quarter. Which is surprising! Shift to organized sector since the unorganized sector couldn’t get going. 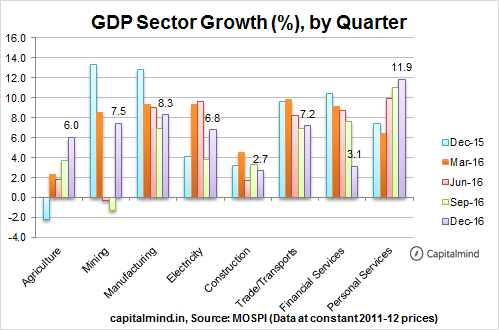 And organized sector is measured well in the GDP. Increased government spending by 20% – which again looks strange, unless you account for higher taxes. Fixed Capital Formation (or investments) is up big time. But that is apparently because sales of steel and cement were up. Inventories are down as companies used up inventories to sell rather than order afresh? Agri growth at 6% is understandable since we had a lousy quarter the previous year. But when people couldn’t transport goods, we saw a big growth in Trade/Transports. Personal services (which includes government services) went up over 11%! Inflation was only 3.8% so while the nominal growth rate fell from the earlier quarter, the impact on real growth wasn’t as much. But there was something interesting – we continued to maintain our Capitalmind Premium Long Term Portfolio, and created an entirely new Momentum Portfolio which has done well. We remained invested in nearly everything – selling only about two stocks and adding many more during the process. The idea was – and we mentioned that in the post – to invest over time, to not panic-sell, and to continue to find good opportunities. We’ve been lucky enough to have had some good stocks, but then it didn’t matter if your stocks were good or bad in the last two months. Don’t give too much emphasis to stuff like Private Consumption – that data can’t be captured directly, it comes extrapolated from production. Channel stuffing means that manufacturers paid excise duty on production by selling to their channels (where traders have black money). Essentially they booked sales and lost inventory, and the government got paid – now the inventory sits with the channel. Q4 is usually a brilliant quarter. But if we look at the data right now we see low credit growth (still less than 5% year on year), rising interest rates (yields are up big time), a difficult time for two-wheeler and rural sales. This will be another interesting quarter to see – if all it takes to move GDP numbers is change a “projection” formula, then we can have GDP at whatever level we want. There will always be valid-sounding explanations for everything. Perhaps it’s just easier to live in a post-fact world and buying companies selling spectacles with rims made of roses.